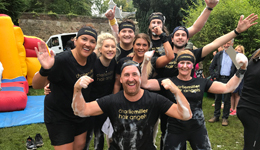 Five Hairdressers, one Trainee, a Maintenance Technician and a PR & Marketing Manager were delighted to make up a team of Charlie Miller Hair Angels for It’s A Knockout Edinburgh 2017 on Sunday 27th August. 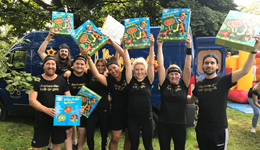 This massively popular UK event organised by WeDo Scotland took place at Duddingston Community Ground in Edinburgh to help raise funds for SANDS Lothians*. With skill and teamwork high on their agenda the 8 superstars (l-r Frank Clark, Neil Purves, Euan Alexander, Hayley Dallas, Natalie Cole, Leia Mackinnon, Yvonne Blyth and Philip Michie) successfully showed off their tactics in The Teletubbie Challenge, The Cannon Run, The Foam Pit and The Ultimate Relay. There was much fun and laughter to be heard throughout the day from the many family and friends who came along to support. 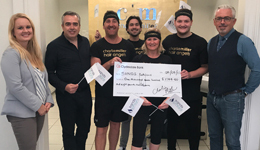 Donations were made in salon and on their JustGiving page and the team are delighted to have raised just over £1,700 which provides more than 42 counselling sessions to the families that SANDS Lothians supports. *SANDS Lothians is a registered Scottish charity offering support, understanding and help both of a practical and emotional nature to bereaved parents and their families who have suffered a miscarriage, stillbirth or whose baby dies soon after birth.